I probably don’t need to bring this one up again. But this is my blog so back off! Anyway, Quentin Tarantino continues to push the form forward more and more as others try to resist change. 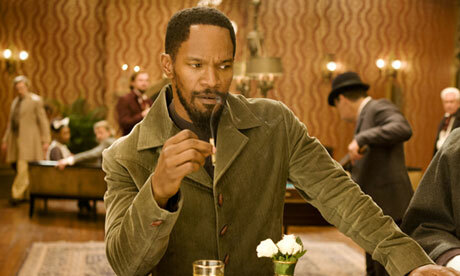 More than anything, “Django” was the most interesting, and often the funniest, film of the year. By embracing inaccuracy, it provided a more accurate satire of backwards southern nobility than any serious historical film could ever dream up. The fact that “Django” both balanced a somber condemnation of slavery with farce on the level of “Blazing Saddles” is still a marvel to me. As the Academy voters grow younger and younger, one day they will embrace Tarantino for the master he is, and his films for the masterpieces they almost always are. Maybe “Amour” went on a little too long for my taste, but I cannot overlook Haneke’s haunting work. Sometimes, the emotions behind “Amour” are too overwhelming for me to even think about. Haneke presented aging and old age in such a removed way that it actually draws us closer to the characters. By stepping back, all of the small details and actions are allowed to unfold. Phoenix was the unsung hero of cinema in 2012. After his surreal performance art hoax that culminated in the documentary “I’m Not Here,” Phoenix shows why he is secretly one of the best actors working today, in a performance that could define his career. As self-destructive outsider Freddie Quell, Phoenix had to take on the task of both being the observer and the weirdest guy in the room. He roams around with slouched posture, almost resembling an alcoholic caveman. And in a film so dark and difficult to interpret, he provided some very overlooked comic relief. If you didn’t laugh at that fart, then you’re not human. As Tiffany, Jennifer Lawrence is masterful at controlling the character’s turbulent mood swings, and channeling all of the right emotion at the right time. That is why the most unforgettable scenes of this film, including one that takes place outside a movie theater on Halloween, and one in which Lawrence basically gets to dig in to Robert De Niro, revolve around her outstanding performance. I was tempted to put Christoph Waltz here for his eloquence and being able to basically be a living embodiment of Tarantino dialogue. However, it wasn’t until I watched Robert De Niro’s return to form in “Silver Linings Playbook” that I realized how much I missed his presence on screen. Unlike his classic performances in “Taxi Driver” and “Raging Bull,” De Niro, while tough, actually provides some of the film’s most moving moments. While he manages to steal the spotlight from the two fantastic leads every time he asks that someone hold the remote, he never tries to dominate the screen. In that, he does what every supporting actor should. Only someone with as much experience and talent as De Niro could strike that perfect balance. While I never reviewed, anyone who knows me knows that I wasn’t necessarily taken by “Les Miserables.” However, I have just as many good things to say about Hathaway’s performance as I do bad things to say about the film. * In just one scene, she combined acting and singing in a way I’ve never seen before. My biggest complaint about musicals is that big musical numbers can often distract from the emotional core of a scene. However, this was not the case for Hathaway’s big solo. After she finished singing “I Dreamed A Dream,” my only thought was, “Anne Hathaway just won the Oscar.” I stand by that thought. Yes, I’m giving out more “Django” love. Tarantino really does belong near the top of the greatest screenwriters of all time. Some would think that he would have never been able to top his early career Oscar win. However, he keeps getting more and more ambitious with every film. Besides twisting history, “Django Unchained” hits a perfect balance of hilarious absurdity and dead serious historical social commentary. Plus, now that Tarantino has figured out how to write for Christoph Waltz, he was able to create one of his best characters ever. Some scenes might feel like they go on for so long, but I always felt like I could keep watching and listening. Also, Quentin is a man so gifted and knowledgeable that he knows how to create violence that is sometimes silly and other times realistic (listen to his recent Fresh Air interview. He also talks about his mom dating Wilt Chamberlain. Seriously.). This entry was posted in Academy Awards, Oscars, Oscars 2013, Who Should Win on February 18, 2013 by ian0592.